First off all I am not sure whether this is a bug or I simply do not get the symbol concept in AD. +) I create a symbol - getting my first instance of it. +) I copy (or duplicate with the ALT key and dragging) the first instance dozens of times in the document. Sometimes I drag them also in from the Symbol panel. 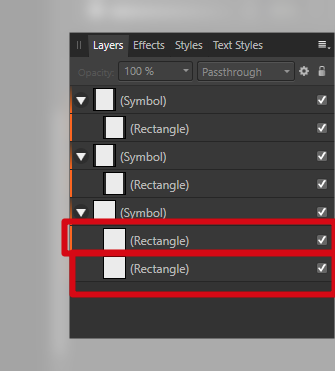 +) All instances are labelled correctly as symbols in the Layer panel. +) So far so good. That works fine. +) Later on I want to change let's say the color or the stroke or both of the symbol in general. So I do it in the Layers panel to one of the instances as to my understanding all the others should update accordingly. And it happens sometimes that changes do not apply to all of the other instances of the symbol - only a few update the rest remains in the old state. Sometimes only a handful update and all the others seem to be detached from the parent (symbol) at all - still being labelled als symbols and me not having them detached at all. +) The strange thing is that it does not happen in all my documents. For me it's like gambling: in some files the symbols behave as expected, in some others not. And I cannot get behind the why or when. #) The synchronisation option is always on! I hardly touch this option. #) I am using also the latest stable non-beta version and have the same issues with symbols. or the child within that symbol? 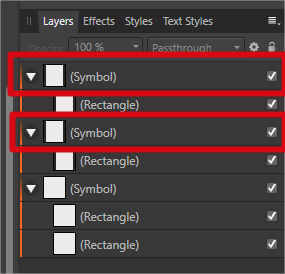 If you want to sync all the changes, you have to duplicate the Symbol(parent) and not its contents. Whenever I duplicate I do duplicate the parent (symbol) itsself. 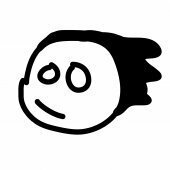 And if I want to change something for the symbol in general I do edit one of the children. Sometimes it works. Sometimes it works only for a few parents. If it helps I will provide a file next time it happens. Would that be more helpful? Yes, that would be really helpful. Also, when it stops working, you should notice a dashed line on the symbol that does not sync. Hover your mouse over and see what attributes are no linked. Thanks for that hint. Now I understand what the color dashes/lines mean. I've never turned off the Sync in the Symbols panel. How can I link/connect/synchronize it again? I'm afraid you cannot re-sync it. Once an attribute is unlinked, it remains unlinked. The only option would be to delete the symbol and insert a new one. I see ... and as I do not know why some of them got unlinked and some not I do not use symbols anymore. Unfortunately it's unpredictable for me what symbols are doing - if I now see that it's unlinked it is already too late. It's hard to see what went wrong as the symbols do not retain that information. It would be something that made them un-synced. You can try out the beta and see how it goes. Actually, this issue persists. The one file from above I mentioned (screenshots) is made with the beta. This bug section is dedicated to the release build. If you discover the steps to replicate it, we can look into the issue. Just chiming in to say this happens to me sometimes too and is pretty painful when I have a large number of symbol instances. 'Performing this action will affect the synced attribute of this symbol.....[Continue] or [Cancel]'. This way at least the user is aware that a Symbol will break as a result of the action and can decide accordingly. That would be nice. I agree. A "Resync all" would be nice too. Let's see what the next stable version will bring us regarding symbols. I'm having an issue with symbols again so I thought I'd raise it here in case for some reason it's expected behaviour. So, I'm using symbols functionality to create a tiled patterm - this way I can update or add to an existing symbol and the tiled pattern as a whole updates (this is for textiles so by far the most efficient method). Unfortunately it seems that using symbols within symbols isn't an option. 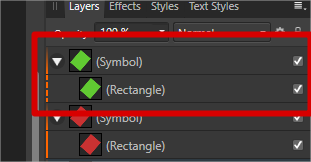 As you can see in the capture below dragging regular curves in to the tile symbol updates the pattern - but dragging a symbol in to an existing symbol doesn't update the instances. I could not replicate this either in the latest 1.7 beta. It all seems to be fine. Symbols in symbols is working in the release version, something is strange though: the symbol with the symbol cannot be converted into a new symbol itsself. So it is a new object on the canvas (shown with "Symbol" in the name) with being linked to the different symbols but no to be found in the symbol pannel anywhere. You cannot create a symbol from an object present in an existing symbol. Ah. I'm still using v1.61 via the App Store so perhaps this is something that has been addressed already. Interestingly (shown bleow) if you drag an existing symbol inside another it doesn't appear in the instances (as I mentioned previously) BUT if you drag the (nested) symbol in to a new layer and THEN nest it, it works! So this is an easy enough workaround, if others are struggling with the same behaviour. Yes you can create a symbol definition from an object that's already inside an instance of a symbol (unless that inner object already is an instance of some Symbol, of course) in AD 1.6.1 and AD 1.7 beta on macOS, and that seems entirely reasonable, so if it doesn't work in AD on Windows then it's a bug. However, I suspect that it does work in the apps on Windows and you meant to write something slightly different. Your object that contains a green ellipse and a nested instance of the yellow symbol is an instance of the green symbol, not an instance of some symbol that is not shown in the Symbols panel. You cannot create a new symbol definition from that object because it already is an instance of a symbol. When you put an instance of the yellow symbol inside an instance of the green symbol, without deactivating synchronisation, the definition of the green symbol should have been updated to match and another instance of the yellow symbol should have instantly appeared inside the other instance of the green symbol. Instead, the app wrongly behaved as if you had temporarily deactivated synchronisation and it made the child instance of the yellow symbol be an unlinked attribute of the one instance of the green symbol. That misbehaviour happens in AD 1.6.1 on macOS, but it has been corrected in the 1.7 betas for macOS so I expect it has been corrected in the 1.7 betas for Windows. Instead, the app wrongly be﻿haved as if you had temporarily deactivated synchronisation and it made the child instance of the yellow symbol be an unlinked attribute of the one instance of the green symbol.